Every Christmas for the past 25 years, I have made spongata from a recipe published in 1820 by one of my favourite cookery authors, the Italian confectioner Giuliamo Jarrin. This delicious peppery honey cake is still made at Christmas in villages and towns throughout Emilia Romagna, Jarrin's native region. Indeed, just about every family have their own recipe, as do the professional pastry shops. All keep their own specific methods and ingredients as proudly guarded secrets. This interesting celebration cake is sometimes compared to the English mince pie, though in reality it is much more closely related to the better known Italian confections panpepato and panforte. Though unlike these celebrated cakes, spongata has a thin coating of crisp pastry. 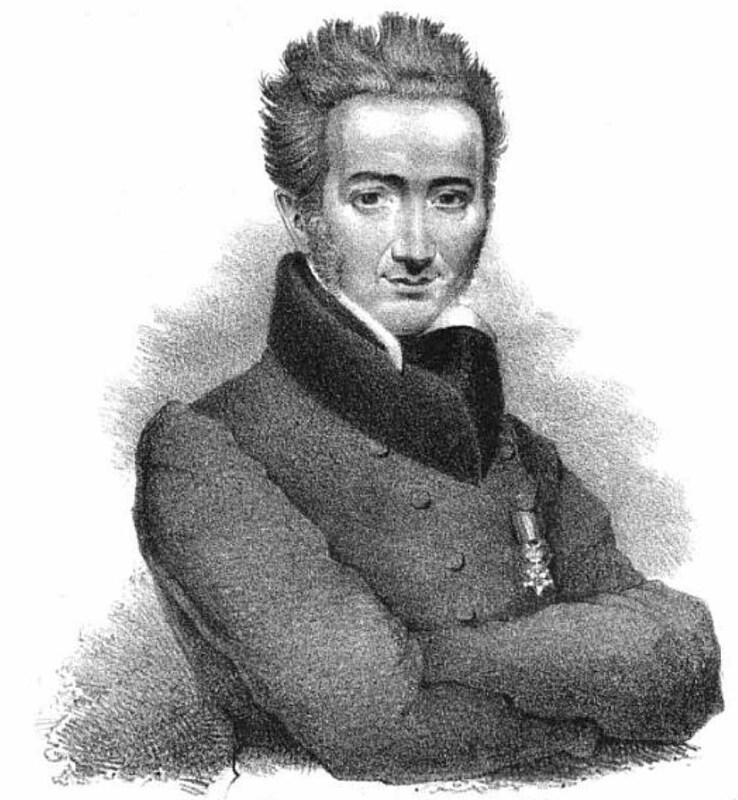 Jarrin was born in the town of Colorno near Parma in 1784. After working in Paris for a while during the reign of Napoleon, he came to London in 1817, where he lived for the rest of his life, running various confectionery establishments in the West End until his death in 1848. He even anglicised his name to William. 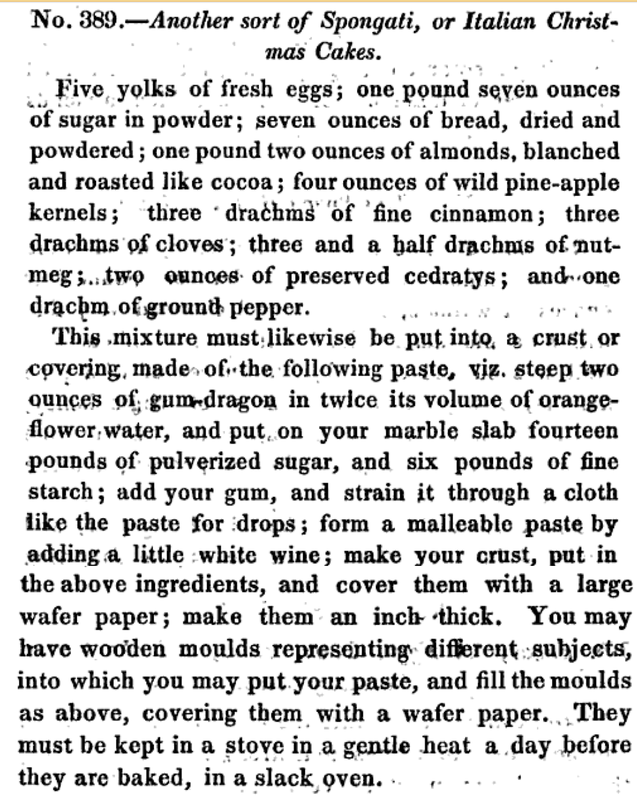 Jarrin's book The Italian Confectioner, which he wrote in English, was first published in London in 1820. It is by far the most important work on confectionery published in Europe at this period and offers a wonderful insight into the techniques and processes used by the professionals. Sadly, it is hardly known in Italy. Though I don't suppose many contemporary cooks and chefs in England are aware of this seminal work on dessert foods either. Unfortunately there is no modern printed edition of Jarrin's book, but the good news is that the third edition of 1827 is now available on Google books (link at end of this posting). Giuliamo Alexis Jarrin from the third edition of The Italian Confectioner 1827. There is another portrait of Jarrin as a younger man on this blog in a posting about cupcakes. 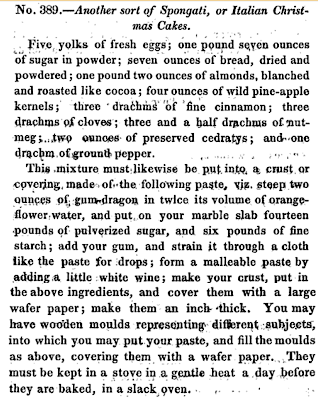 To my knowledge, there are no recipes for spongata in any of the works on cookery and confectionery printed in Italy during the eighteenth or nineteenth centuries. Jarrin actually gives us two. 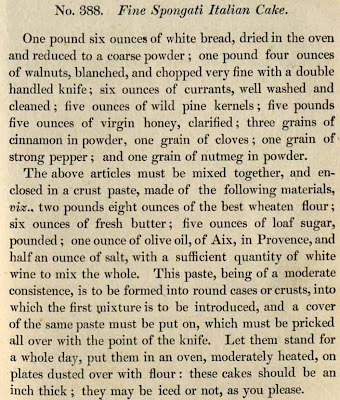 As far as I know they are the earliest printed recipes for this regional cake, predating any published in Italy. It is ironic that they were issued in London in English. Both of Jarrin's recipes can be found at the end of this post. Do try at least the first one, as it is easy to make and very good. The second is a bit more tricky. There are a number of theories concerning the origin of spongata. Some suggest that the cake is a survival from Roman times and offer a rather tenuous argument that it is similar to one described in Petronius's Satyricon, written in the 1st century AD. Cakes are mentioned in the celebrated passage describing Trimalchio's extravagant feast, but not in enough detail to make a positive identification as spongata precursors. 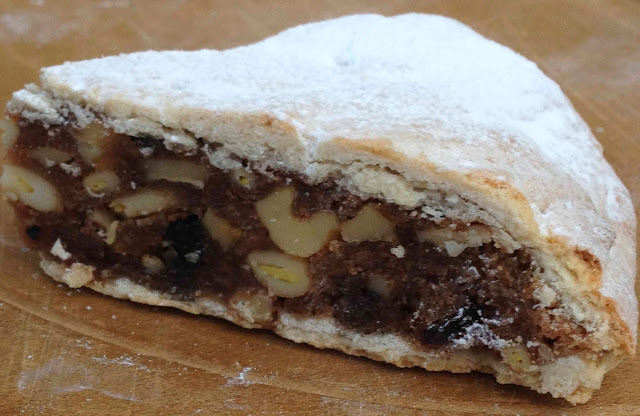 Certainly, all the ingredients spongate contain - honey, breadcrumbs, pinenuts, walnuts, currants, pepper, cinnamon and cloves - were all familiar in the Roman kitchen, but there does not seem to be any actual evidence that the Romans made these cakes. Others believe that the cake is Jewish in origin. Whatever the truth, it is certainly pretty ancient. It first gets mentioned in a letter dating from 1454 to Francesco Sforza, the Duke of Milan. * As you would expect, there are many other stories about this iconic and delicious cake, but like many other food legends they are very difficult to verify from historic sources. However, as an historian who enjoys replicating period dishes, what interests me much more than trying to figure out the origin of spongata from the scant historical record, is to understand a little more about its appearance and how it was made. Happily, help is at hand in the evidence provided by the marvellous etching reproduced below, a small detail from a board game published in Bologna in 1691. 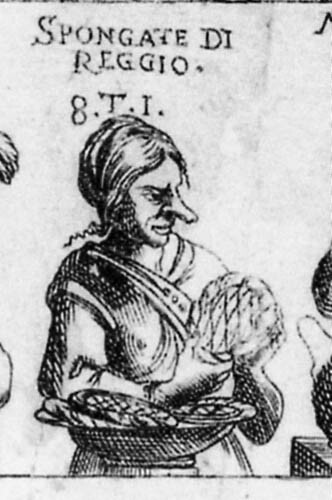 A spongata vendor from a board game published in Bologna in 1691. In his recipe Jarrin tells us to prick the finished cake all over with 'the point of a knife'. Most modern day spongate made in Emilia Romagna are still pricked all over in this way, usually with a skewer. However, what strikes me about the late seventeenth century spongate being sold by the long nosed gentleman above, is that they are marked criss-cross fashion with holes in the centre of the individual diamond shaped lozenges. This is a very familiar pattern to me, because an identical one was once called for in pricking or 'docking' Shrewsbury Cakes in seventeenth century England. This effect was achieved by marking the cakes with the teeth of a comb and then making a small hole in each lozenge, as in the photo below. 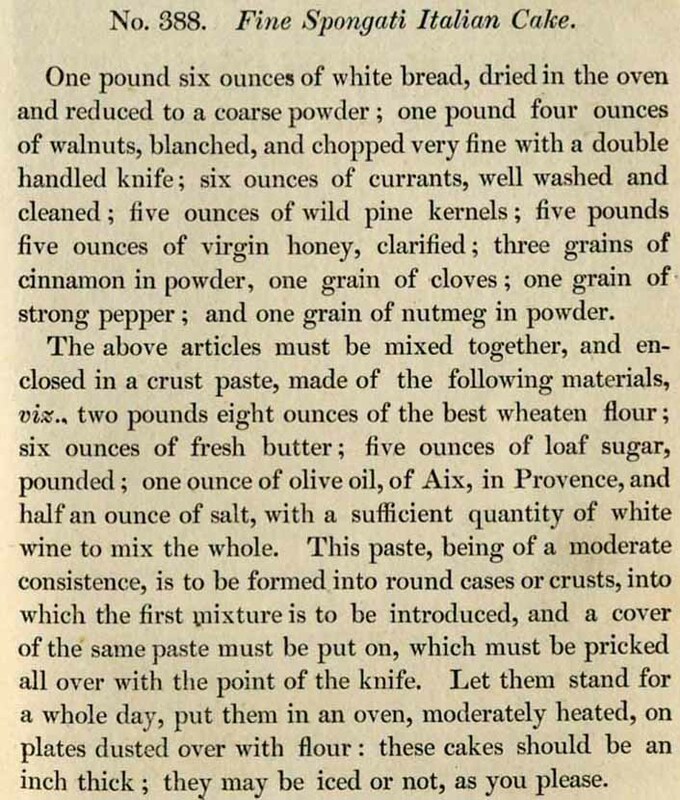 In his manuscript cookery book, the diarist and courtier John Evelyn gives a recipe To make Shrewsbery cakes, in which he instructs us to 'pricke them with the great teeth of a comb that is new and kept for that use'. 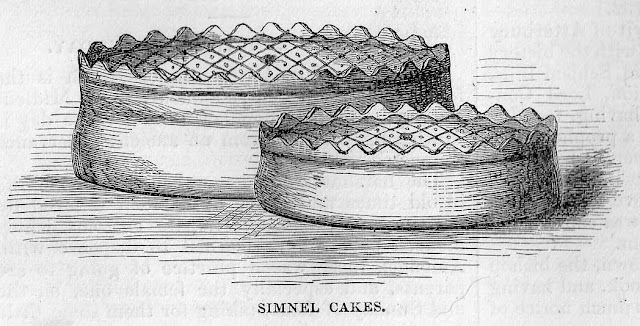 A similar pattern was used to mark another Shrewsbury speciality, the simnel cakes made for mid-lent Sunday and illustrated (as below) by Robert Chambers in The Book of Days (London: 1862). The probable origin of these markings, at least with the Shrewsbury cakes was to enable the cakes to be broken into smaller pieces without having to cut them. I suspect that the markings on the spongate in the 1691 Bologna etching were for the same purpose. 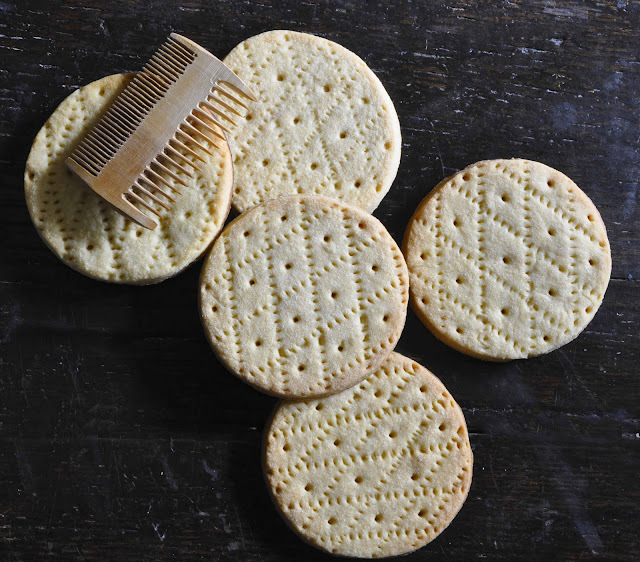 So in recreating my spongata cakes, I now mark them with a comb as in the picture below. 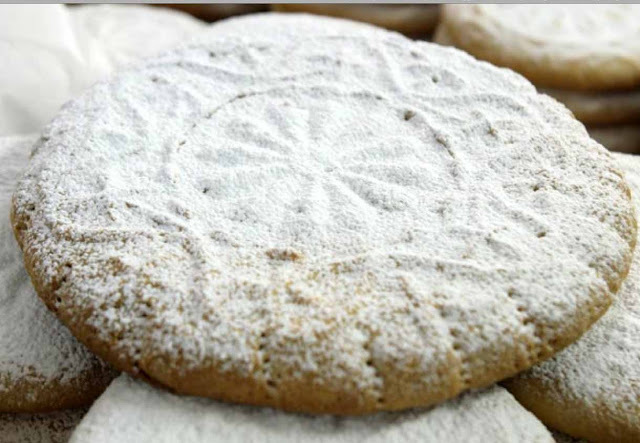 After baking, I dust them with icing sugar, which is still common practice thoughout Emilia Romagna. Spongata di Corniglio - the website where I borrowed this image has another showing a baker printing a spongata on top of a wafer paper just as Jarrin describes. Jarrin's recipe for spongata from The Italian Confectioner. (London: 1820). Jarrin's second recipe for spongata or Italian Christmas cake. * G. BERNARDINI, La spongata: dolce tipico di localita del territorio parmense. Origini storiche, le tipiche località di produzione, le ricette, Parma, Tecnografica, 1995. Accademia Italiana della cucina, Delegazione di Parma. Further to your google link, for anyone with an ebook reader (kindle etc), it's here http://www.archive.org/details/italianconfecti00jarrgoog in many formats. I have just discovered your blog and find it fascinating. I have all Elizabeth David's books which are well-researched (do not have the one about Ice), Dorothy Hartley's Food in England, and Claudia Roden's Book of Jewish Food. I grew up in Lancashire and when I was a child my grandmother who was from Twickenham made something I still make on occasion - sad cake - which was an unsweetened short pastry disc speckled with currants or raisins and baked till brown. 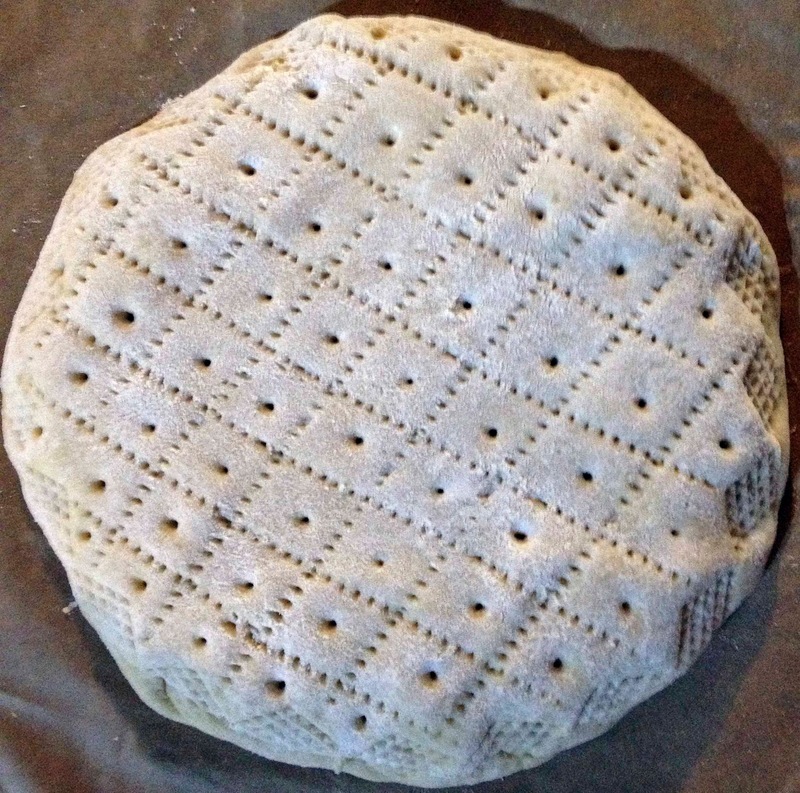 "Sad", I think, because it was unleavened. 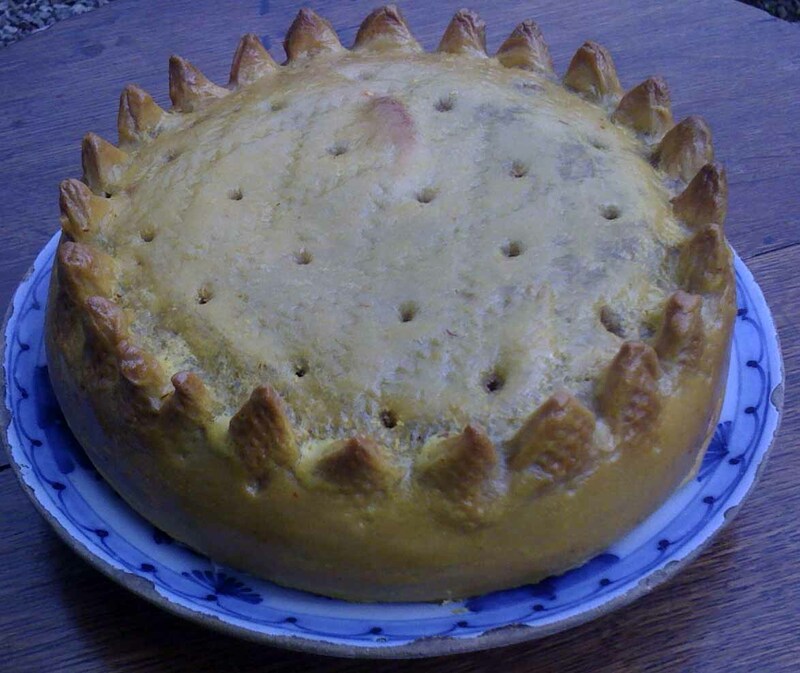 If I were not low-carbing I would make the spongata this weekend - perhaps in the Autumn when waistlines are back to a desirable measurement.